The Science Museum's Ben Russell and John Liffen on technology that reflects on the ideals of the comic hero. Dan Dare images courtesy of Dan Dare Corporation. 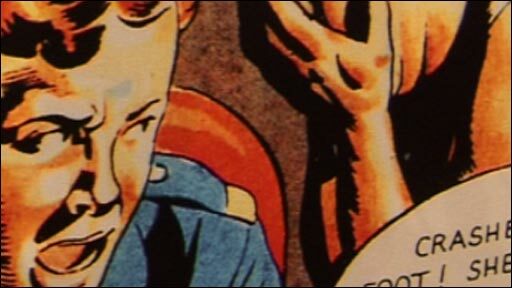 Classic comic hero Dan Dare fired the imagination of young Britons in the 1950s and heralded the birth of hi-tech Britain, an exhibition at the London Science Museum reveals. A British-built nuclear bomb and a prototype of the BT Tower are on display as part of the show. The museum says the Eagle comic's space hero not only reflected but influenced the UK's wealth of inventions during the 1950s and 60s. Portable televisions and radio alarm clocks are among the collection, capturing the upbeat spirit of Eagle. 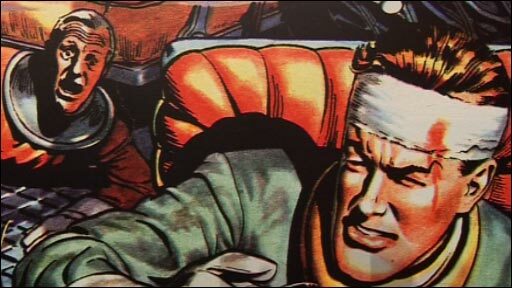 The character Flamer was based on Peter Hampson, son of Dan Dare creator Frank Hampson. Courtesy of Dan Dare Corporation. "Dan was packed full of... very credible technology that was in there in very minute detail", Peter Hampson, the son of Dan Dare's creator, Frank Hampson, told BBC News. He said it enabled children to be inspired by science. But nuclear weaponry highlights the more sinister and less well known aspect of British research in the 1950s. Science Museum curator Ben Russell said the government emphasised the benefits of nuclear power, but in reality built reactors to ensure the country could create its own atomic bombs. In later years the technology's domestic uses became more prominent. He said: "What Dan Dare was doing depended on the innovation and industry that was happening in Britain at the time. There was enormous drive to modernise and maximise output. "The whole point of Dan Dare was that is was supposed to be very positive about technology. Unfortunately, in real life things were not quite as Frank Hampson might have hoped."